Inside:This is a collection of fun summer activities kids love as well as parents. 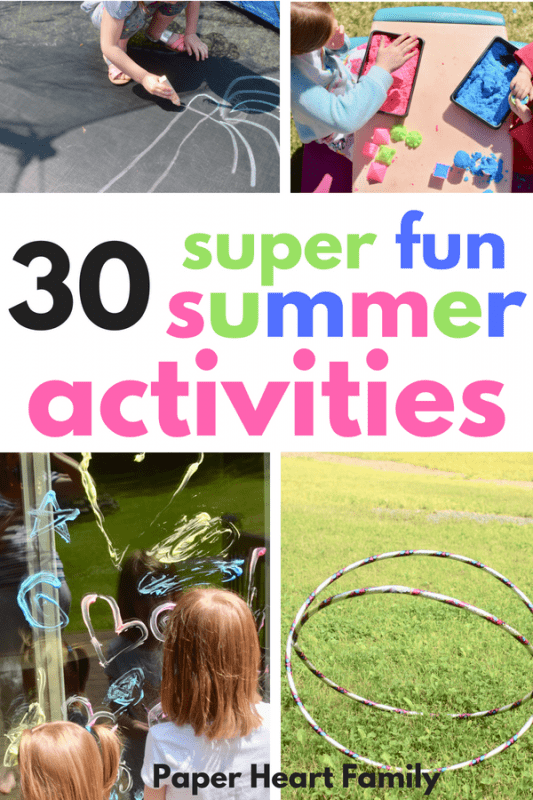 These unique summer activities for kids at home are guaranteed to get your kids out of the house and active. Your kids will love these cheap and free summer activities like Water Gun Soccer, Hula Hoop Crawl, Drip Drip Splash and more! Which means lazy days, beach vacations, cookouts and lots of outdoor play. I remember being outside constantly as a kid. While I didn’t need a parent to tell me what to do and plan activities for me, it was also a different time. I believe we as parents now have to make a little bit of an effort to get our kids off the couch, off of their phones, to stop playing FortNite, etc. When we were kids we had no other choice than to go outside and entertain ourselves! We would have been bored to death otherwise. Now, kids have access to so many things that having old-fashioned outdoor fun might be forgotten. Sometimes our kids take a little convincing to get outside. It’s different in every household. For me, it’s my 6 year old’s neverending fears. She’s afraid of storms, which means she’s also afraid of wind, she’s not a fan of bugs, and so on. Anyone else’s kid like this, because I’m telling you, I’m going crazy over here. That’s why I wanted to come up with a list of awesome, different and simple (because mama doesn’t have time for elaborate) activities to do on summer vacation. So that I can lure my daughter outside and she will start to become trained to love the outdoors, instead of fear it. For other families, it might be the lure of the screen that keeps kids inside. 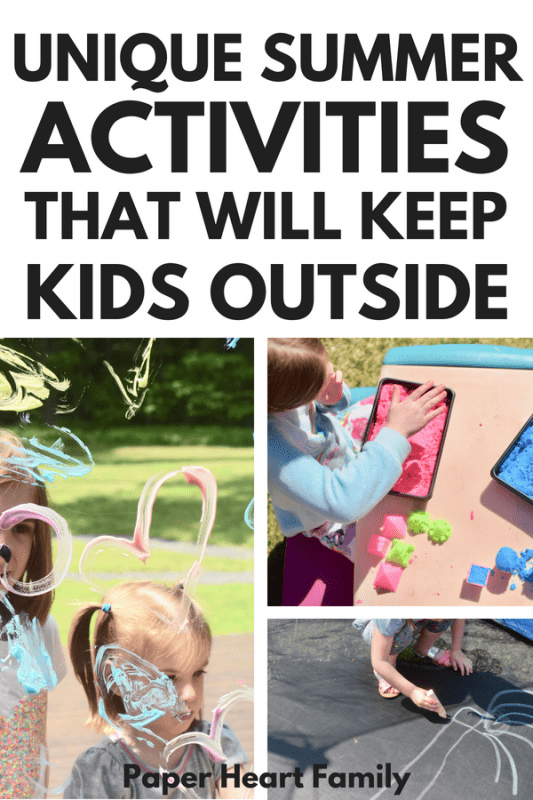 These outdoor activities will help you to limit screen time and instead get your kids outside being active and happy. Whatever the reason may be, getting our kids outside is important now more than ever. These fun activities for kids at home are just what you and your family need for some simple family fun. And if it’s rainy and yucky and you can’t make it outside, these activities are perfect for keeping your child active INSIDE. These are not only cheap and free summer activities, but they are simple to implement too. If you have some high powered water guns, all you need to add in is a few tubs of water and an inflatable ball and you’ve got a fun game of water gun soccer. We did this with our kids the other day and they literally played for over an hour. You simply need to make a sphere shape with two hula hoops. 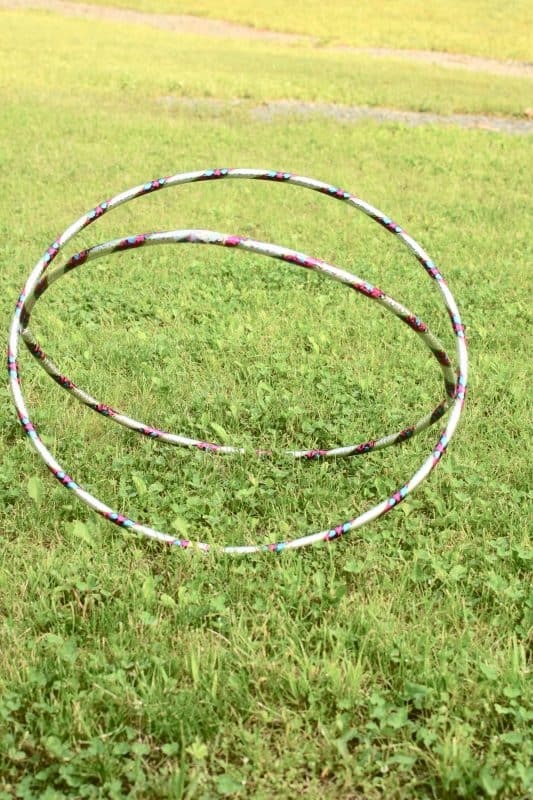 Then you can have your children try to get through the hoops without touching them. When we did this activity, we didn’t use water balloons, we just filled regular balloons with water, which makes for a really big and really strong water balloon. Then your kids can throw them, lay on them or jump on them to try to get them to pop. It will keep them busy for a while because regular balloons are surprisingly strong, even when stomped on. We have also done it with ziploc bags, which are also ridiculously strong. This is a super simple DIY splash pad that you can make using a tarp and some pool noodles. The perfect solution for when you don’t have a pool. 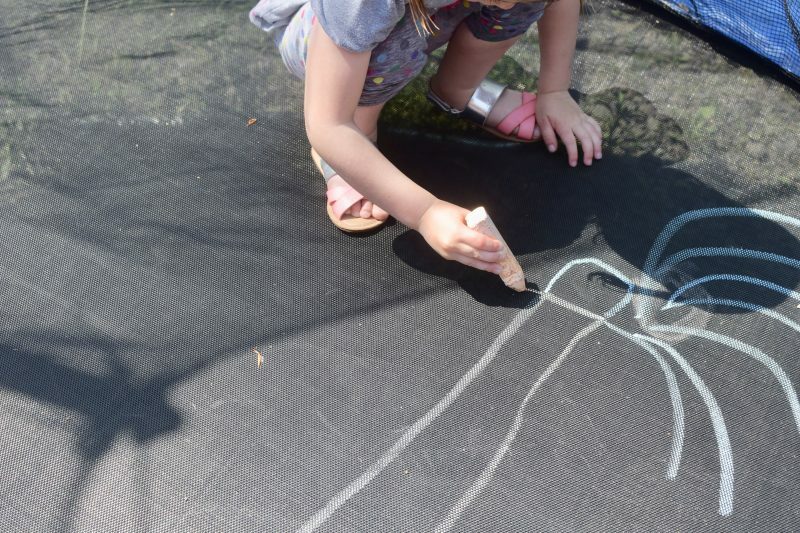 Did you know that you can write on a trampoline with chalk? This is a must if you don’t have a paved driveway. Do you have the original stomp rocket? This is like the original, but made even better with the addition of water. When your child stomps, water sprays up along with the rocket. Warning: parents may enjoy it more than the kids. There are lots of fun activities that you can do on a trampoline. How about an on-trampoline version of Marco Polo? You can find more trampoline game ideas here. You know those old school, gym class parachutes! They were so much fun. And don’t worry, it you don’t have one, you can use a tablecloth. Collect any small balls that you have around the house and take it outside! See this post on keeping your younger child active inside and out for more ideas. There’s something special about laying a blanket out on the grass and having a picnic. Make it special by having your kids pick the menu. Last year, we had a picnic with hot dogs, watermelon and ice cream waffles for dessert. You can create a super simple ring toss game using cheap pool noodles as seen from Mission to Save. 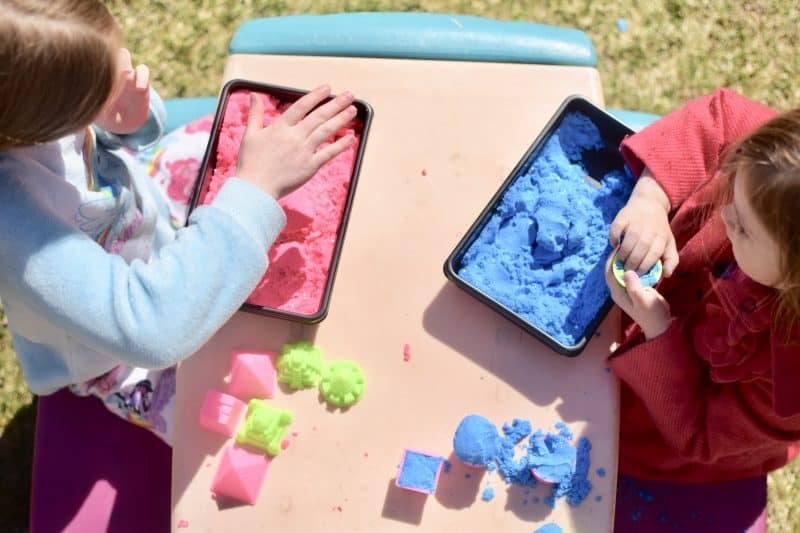 Really any indoor toy can be taken outdoors to play with, but I love taking our play doh or kinetic sand out because then there’s no mess inside. I am a huge fan of creating obstacle courses, but this one from Heart of Deborah just might be my favorite. She has some amazing kid’s obstacle course ideas. However, you could totally make a much simpler one with whatever you can find around the house. Get your kids to help. You might be surprised by what they dream up! We have an annual family olympics, and your family should too! It’s something everyone looks forward to. You can include family Olympics game ideas such as The Wheelbarrow Race, Three-Legged Race, Relay Races, Crab Walk, Long Jump, High Jump, and so much more. What’s great is that most activities require very little prep. There’s no better way to cool down than a little ice play. You can find lots of ideas here. We even like to try building ice towers or ice castles. Did you ever make tin can stilts when you were a kid? I know I did! An oldie but goodie! How fun is this? We went out on the deck, I put shaving cream mixed with a little food coloring into cupcake tins and let the kids loose. The best part is that cleanup is a breeze with a quick hose down. Original idea from Happy Hooligans. 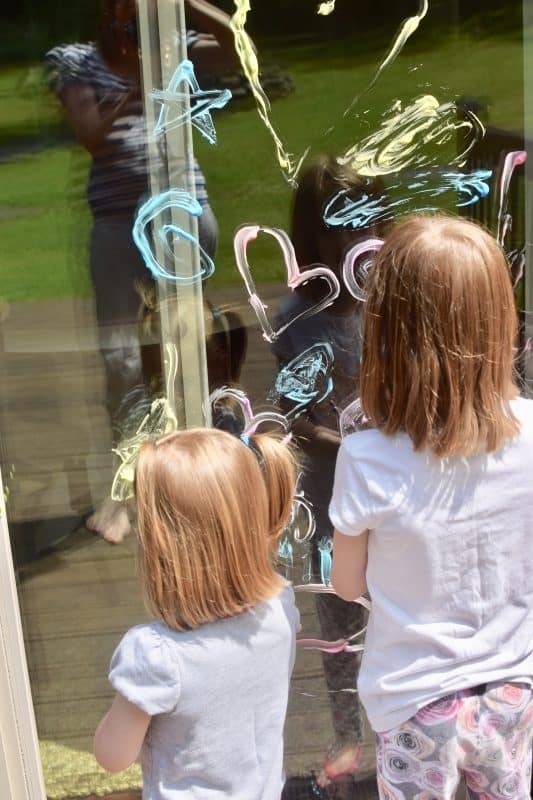 This is a fun activity perfect for the outdoors (just ask my jute rug that is now stained from when we made Shaving Cream Clouds inside). This is such a unique obstacle course idea. Just write the instructions on your driveway with chalk! Have an old sheet laying around? Instead of throwing it away, lay it outside and let your kids paint. I love reading to my kids but I REALLY love reading to them outside. Your kids will love it too. Have a Duck, Duck, Goose obsessed child? How about throwing water into the mix? Duck is replaced with dripping water and Goose is replaced by a big splash of water. Turn your local playground into an obstacle course! See more from The Many Little Joys. Hot Potato with a water balloon becomes a little more exciting. For this game, you play musical chairs as normal, but each chair contains a water balloon. In order to claim the chair, the child has to sit on and pop the water balloon. The traditional slip-n-slide is fun, but that little plastic strip is so tiny! 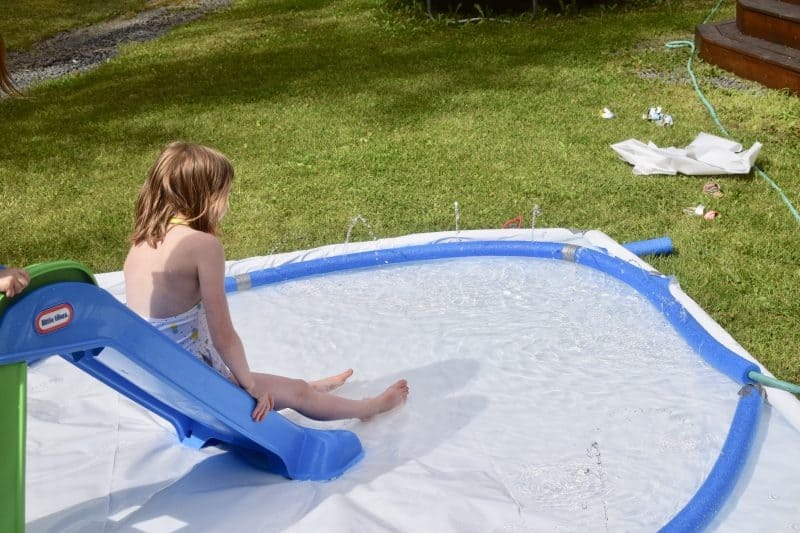 This DIY Slip and Slide is simple to make and can be as big as you want it to be. Take a hose, make the spray go back and forth low to the ground, and have your child jump over it just like a jump rope. Kids love playing in the rain, so why not make some. Turn your garden hose onto “mist”, aim in into the air and arm your kids with umbrellas. Or without! That’s fun, too. You can even do this when it’s really raining, or you can check out these rainy day activity ideas. Do you have the game Twister? Take it outside, throw some water on it, and Twister becomes a little more challenging and a lot more fun. What are your favorite activities to do with kids outside? Thanks so much for the sweet reply, Yasmina!